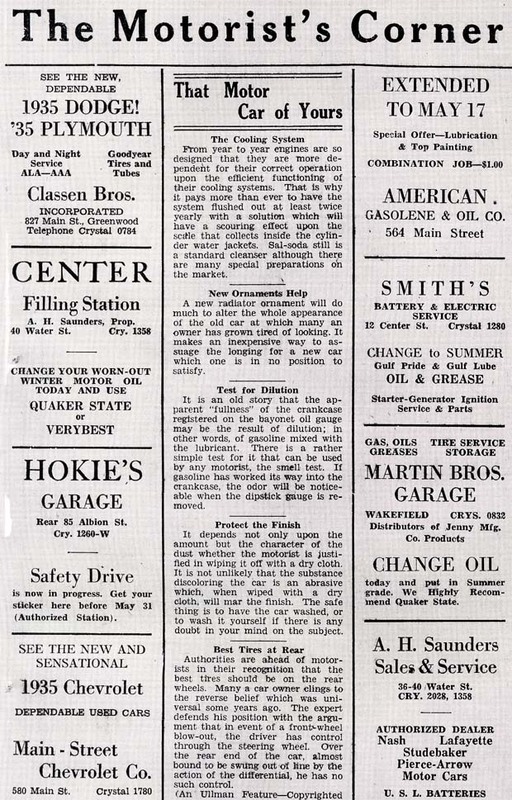 "Printed weekly in the newspaper, the Motorist's Corner featured local garages, gas (filling) stations and automobile dealers that offered specials such as American Gasolene & Oil Company's lubrication and top painting combination job advertised at $1.00. The column also included motor car tips for owners, such as why and how to clean the cooling system, how radiator ornaments change the appearance of the car, how to detect if gas has entered the crankcase, how washing dust off a car is sometimes better than wiping it off with a dry cloth, and why the best tires should be on the rear wheels. Hokie's Garage, a longtime fixture in Wakefield, is still in business as the Woodville Service on Water Street. Established in Montrose around 1926 by Maurice 'Hokie' Lenfest, the business moved to the community garages at the corner of Lincoln and Mechanic (Princess) Streets in 1928. The business moved to the rear of 85 Albion Street in 1931, and, in 1936, Lenfest bought the Kirk Brothers' grain store at 62 North Avenue at the corner of North Avenue and Armory Street. Hokie closed his business in 1956 and became associate with his son Paul at Woodville Service." - Text from calendar by Jayne M. D'Donofrio. “The Motorist's Corner, 1935,” NOBLE Digital Heritage, accessed April 20, 2019, https://digitalheritage.noblenet.org/noble/items/show/7094.